Tri-weekly mail up Fox River, via Dayton, Northville, Pennfield, Bristol, Oswego and Aurora to Geneva, arrives every Monday Wednesday and Friday at 8 o’clock, p. m., and departs every Tuesday, Thursday & Saturday, at 3 o’clock, a. m.
The Dayton post office was established in 1837. 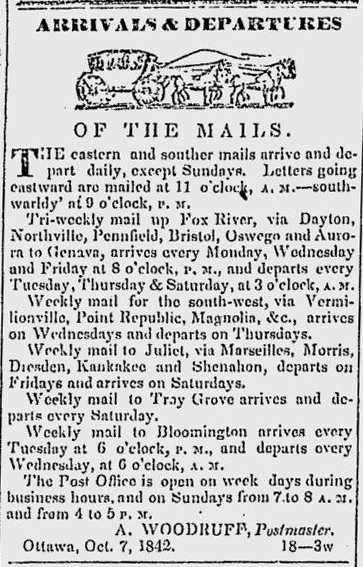 In 1842, as this mail schedule shows, Dayton was on the Fox River route up to Geneva, in the north. Because of the relative ease of the river route as compared to the overland routes, there were three mail deliveries a week in Dayton, whereas the other routes only provided weekly service. There was no home delivery of mail, so stopping by the post office to get your mail was also a social activity for the exchange of local news. In 1842, prior to the use of envelopes and postage stamps, letters usually consisted of one sheet, folded, with the charge (paid by the recipient) written in the corner. At this time, the charge for a letter was 25 cents, and often a letter languished at the post office until the recipient could afford to retrieve it. A story is told of a man whose letter lay in the post office for over a month because he could not collect the money to get it. He finally traded the postmaster four bushels of wheat for it and thought he had made a good deal, so anxious was he to hear from the folks back home.